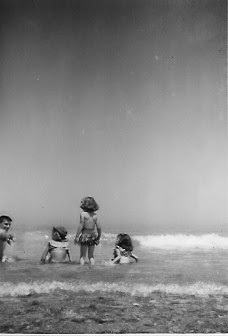 The summer of 1952 we went to Cape Cod. In all of my five years, we had never traveled so far from home. 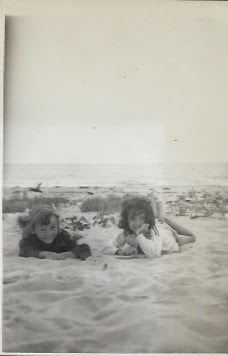 Summer vacations, up until that time, had meant a visit to Mom's sisters and their husbands on Fishers Island. A delightful place, to be sure, but it paled in comparison. In those days, only several years after WWII, there wasn't a great deal of money to be spent on vacations. But Mom seemed able to work magic with a limited budget. She found a little cottage right on the ocean for an unbelievably low price. For two weeks, we would live just steps away from the Atlantic Ocean. Dad packed up the old Chevy, and we were on our way - Dad, Mom, my baby sister and me. The little cottage did not disappoint. Cozy and welcoming, it sat overlooking the sea. Some of the things I remember about those two weeks are my own, others are the stories my Mom and Dad tell and retell. The one thing they both never fail to say is how astounded they were that I rushed down the stairs and into the frigid waters. Dad said it was so cold he could hardly stand to put his feet in, let alone swim. I don't remember the cold. 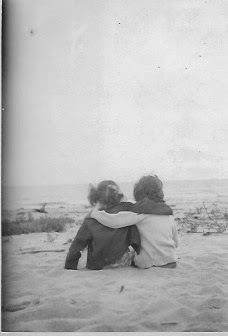 I remember that I, the shy, timid one, made a friend. Her name was Diane. For those fourteen magical days we were inseparable. Some days were cold and windy, but it didn't seem to matter. We played in the sand and splashed in the ocean until our lips turned blue, and we couldn't stop shaking. One night we woke to the sound of someone shouting. Dad went out to investigate and rushed back into the cottage to tell us there were dozens of fish beaching themselves on the sand below our cottages. So in the middle of the night, everyone gathered to see the incredible sight - and to pick up their fair share of fish. There was a day when the wind blew strong, and the waves grew tall. We weren't allowed to go into the water that day, but most of the families were on the beach relaxing and playing. Suddenly someone stood and pointed out to sea. A small boat could be seen on the distant horizon. It soon became apparent that it was in trouble. We could see someone standing and waving what looked like a white handkerchief. With little thought or discussion, my Dad and a couple of the other men ran to get a motor boat. They jumped in, started the motor and headed out to rescue the people in the boat. The waves were so big there were times we couldn't see them. Everyone stood on the shore watching and praying. When they finally got to the boat, Dad said, the people were terrified. They were so far out, what looked like a handkerchief was actually one of the women's slips. She had taken it off and was waving it in a desperate attempt to attract attention. Fighting the wind and waves, Dad threw them a rope. It took a few agonizing tries, but one of the men in the stranded boat finally caught it, and they towed them into shore. It took such a long time, the engine of the little motor boat straining against the weight and waves. Cheers went up when the boats made it back to shore. I thought it a great adventure. My five year old mind didn't understand the grave danger. I only knew my Dad was courageous and strong. About this time of year I feel a pull to the ocean. I am deeply moved by its vastness and power. I feel close to the God who cups it in His hands. I'm linking to the High Calling where we're gathering to share our best vacation stories. Come share your story. This is a great story, Linda! And so many memories. What was the deal with the fish I wonder. I don't what the deal with the fish was, Darlene. Maybe it was the same thing that causes whales to beach themselves. I don't remember it clearly - just the stories Mom and Dad tell. I do remember there was a giant fish carcass on the beach that we found endlessly fascinating. I've never gone back, but it's something I dream about doing one day. Wow Linda! This is quite a story! I am so struck by that image of the white slips being waved in the air. So glad you made it through the ordeal! Wow, wow, wow! I love your memories and the stories and the images of the fish and the boat the woman's slip! This is marvelous!! What a beautifully told story and such lovely memories! Thank you so much Kathryn. It was an unforgettable summer for a little girl. Thank you Ann. Your words mean so much to me. It was an exciting time Jennifer. I have a longing to go back some day. I have never seen the ocean; I'm terrified of big bodies of water. I'm sure it is beautiful for those unafraid. Two summers, when I was a teen, we drove to Flint, MI to visit my sister and her family. I suppose that's the only vacations I remember. Being farmers leaves little time for vacations. What wonderful memories you've told so colorfully. I was right there with you, sand between my toes and everything. I, too, am struck by the image of a slip waving. Linda - What a wonderful story, and these memories are so vivid. I love the pictures of all the children. This trip to the sea must have felt like a fairy tale - for your mom more than anyone - after all the difficulty of those war days for her. Thanks for sharing this.